Urgent info needed. How long is a PMV pigeon contagious. I found a PMV pigeon on 7th December 2017, already showing the twisted neck symptom the day I found him. As of 3 weeks ago the bird fully recovered, still has miiiiild slant on his neck other than that, the bird is fully recovered and active again with care. However, this bird came in contact with my healthy male pigeon who pecked him once when this pigeon escaped to the other room where they hang out. I quickly showered him with disinfectant and all that. 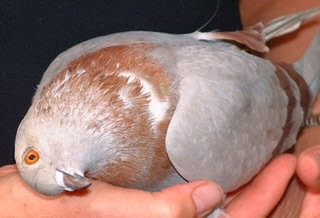 It has been 7 weeks and 5 days so far since I got this PMV pigeon. Almost 8 weeks. Is the male pigeon going to be okay? How long is a PMV pigeon contagious for?